I have been blogging for a few years now. To be honest, there’s been days that I’ve asked myself why I even bother. I mean most of the comments that I get about my writing are from spammers. On an average day, 5-10 people from around the world take the time to read what I felt so compelled to share that day. Last week was different. I was taken aback when a sweet friend came up to me and thanked me for writing a blog entitled, Stains. This blog entry was about being raw and honest about our failures because the Bible teaches us that there is strength in weakness. The funny thing is that I was getting ready to delete that post. Then later in the week I wrote a post entitled, Muscle Cars, and I must have struck a chord because I had men calling me and stopping me to talk about the idea that I shared in that post – an idea about starting a men’s ministry to win every garage and family for Christ, one man, one heart at a time. As I have been praying and talking to other men about starting a garage-based ministry for men the past week, it’s like all of my past experiences, friendships, interests and passions have come together for a moment such as this. I was very active in the Promise Keepers (PK) movement, back in the 1990’s. In fact, I organized several buses to take the men from the church that I was attending at the time to the Stand in the Gap rally at the National Mall in Washington, D.C. in 1997. It’s estimated that 800,000 men were at that event, and I was one of them. I can’t put into words what it was like to stand in a crowd of 800,000 men during a time of prayer and utter silence before God. I can’t put into words what it was like to sing in unity with that many brothers in Christ, men of all colors, with different backgrounds, from different denominations, with different passions. For one day all of these men were united before Christ, admitting our sin, and asking for God’s guidance for our country. The rallying Bible verse for Stand in the Gap was Ezekiel 22:30. I don’t know much about working on cars. I do know how to change oil. And thanks to YouTube, I was able to repair the automatic door on our last van a few years ago because I was too cheap to pay someone else to do it. But I do know that there are a lot of guys out there that do know how to work on cars. Imagine what would happen if these guys came together for garage fellowship. Maybe we could get our sons and daughters off the video games and smartphones long enough to get greasy and learn something – something about life, something about their dads, and something about God. At first I was envisioning just a father-son based ministry but then God opened my eyes to see clearer. I asked my twelve-year old daughter if she wanted to go on a bike ride with me this past Saturday because it was unseasonably warm. She said, “Naw.” Then I asked her if she wanted to go to the hardware store with me to get some caulking and help me caulk the windows and she brightened up and said, “Yes!” Go figure. So we went to the hardware store and found our caulking and were on the way home when we heard horrible noises coming from my 6,000 mile-old Dodge Challenger. Needless to say I was concerned, and Paige and I pulled into a nearby repair shop 15 minutes before closing. We all looked over the car and couldn’t find any obvious issues so the garage was kind enough to send a mechanic out with us for a test drive. We didn’t hear any more sounds from my Challenger, but I did make a new friend. I shared some of the ideas that we are putting together for a garage-based men’s ministry called h.o.o.d (holy order of dads) with this mechanic and then he shared his life with me… for 1.5 hours. Paige and I sat in the Challenger-turned chapel and listened to a man who was hurting and needed a friend. I prayed with my new mechanic friend and gave him my contact number in case he wanted to visit our church or get involved with h.o.o.d. In his book, Wild at Heart, John Eldredge suggests that men are getting bored going through the motions at church. He says, “Deep in his heart, every man longs for a battle to fight, an adventure to live, and a beauty to rescue.” I agree. If you like the idea of a men’s discipleship-based ministry, who’s only goal is to hang out with other men to learn how to be become better men, better fathers, and better husbands then let me know. If you like the idea of a group of men hanging out in garages listening to rock n roll music, talking about real issues that all men face, let me know. If you like the idea of a men hanging out in garages fixing cars for single mothers, the elderly or anyone else who can’t afford a mechanic let me know. If you like the idea of a ministry where farting is allowed (but not encouraged) let me know. If you are a wife or mother who loves the idea of getting her husband off the couch to do something with other men and his children, let me know. If you are going to pray for Ron, Chris and I as we step out in faith, let me know. 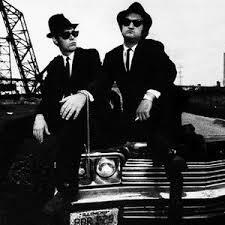 If you love the Blues Brother’s movie, and are crazy enough to join me in believing that we just might be on a mission for God, let me know. Men, there IS a battle to fight, there IS an adventure to live, and there IS a beauty to rescue. God is looking for a few good men who are willing to stand in the gap with their brothers. Saddle up, it’s going to be a wild ride.